Welcome to my first ever Lawnscaping Blog Hop! I am so very thrilled that you are here! You should have come to me by way of Ruza Rebel. This theme is all about RED!!! The hop runs from Friday, December 9th - Sunday, December 11th! Make sure to comment on all of the blogs because there are LOTS of prizes to be won! All the details can be found on the Lawnscaping home page. I love red christmas and I thought it would be fun to make the tree from the Critters in the Forest look more christmassy by stamping some musical notes from the Pa rum Pa Pum Pum set. Both were white embossed and colored with distress ink & an ink applicator tool. The white panel was stamped using 4 different christmas/winter sayings from various Lawn Fawn sets. I used small snowflakes to create a background. Stamps: Lawn Fawn Critters in the Forest, Pa rum Pa pum pum, Critters in the snow, Bows & Holly. Inks: Ranger distress inks (fired brick, walnut stain), Colorbox Frost White pigment ink. Next head on to the blog of the ever so talented Vera Yates. If you've gotten off track, don't worry! Head on back to Lawnscaping to see the complete list of designers and prize information! ps. I have a very good friend named Pia!! Creative idea, Pia! I love your musical christmas tree! Love music notes, such a creative card! 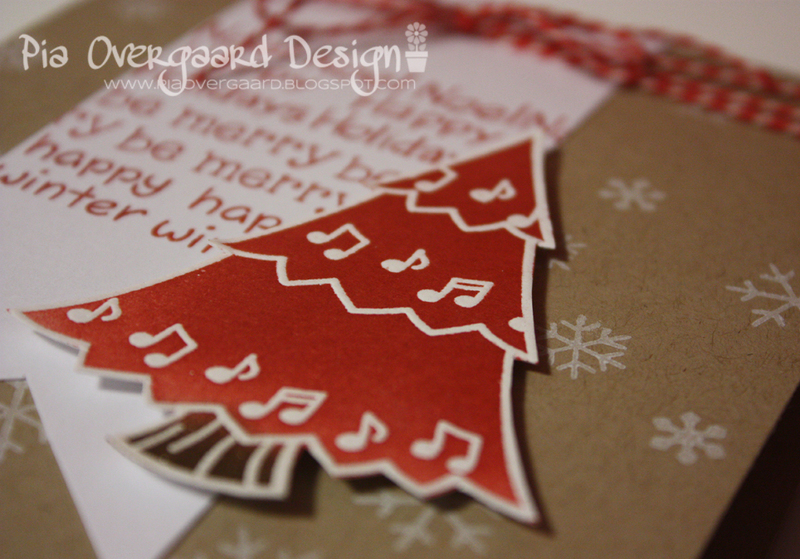 Love the idea of the music notes inside the tree - definitely something I'll incorporate into my Holiday art. Thank you! So creative that you stamped some musical notes onto the Christmas tree! very cute, and love that tree! Love your pretty red tree and Christmasy text! Great job! Beautiful card, Pia! I think the red tree look wonderful with the musical notes on it. That red Christmas tree is fabulous! What a great idea using the music notes like that! I am loving seeing so many different ways to use that tree. the embossing is just gorgeous on the tree. love the use of the musical notes on it too! your card is so cute ! love the snowflake background and the christmas tree ! The tree looks amazing! And such an original idea! Love the card! Its adorable :) Thanks for sharing! The hop is so full of wonderful inspiration. Love me some red christmas tree with music notes! Vilket snyggt julkort! Älskar färgerna och din design är PERFEKT!! I love that red tree, so fun. Very nice embossing on the pretty tree! Cute...I almost missed the comment form...had to come back a second time to find it but cute card! I love your red Christmas tree! Great card, love that coloring on the tree! I love that tree, is both elegant and cute, the whole card is amazing! I love love love that word cluster!! Such a cute idea! And how adorable is that red tree? Love it!! Kraft is one of my favourite base colours ,red is a perfect addition,love it. Such a great card...so simple yet beautiful!! Great ideas and sets used!! I love it. The musical notes as ornaments on the red tree are perfect. As a lifelong music lover and the mom of two band students, I totally LOVE the musical tree! What a fabulously creative idea! The twine is a perfect festive touch. Lovely card! Love the embossed tree, and all those sentiments! TFS! I love the tree and the notes! Great idea embossing the tree. Love your design. What clever ways to combine the stamps! Very nice work, I really like your tree. I love the music on the tree, makes it extra special. Love the whole design really, super crisp and clean! great tree, especially like the fact that it's red! it,s a lovey card, I like them so much on kraft paper. I just love your embossing! And the red tree is wonderful!! Love your style Pia! This card is pretty!! I just adore your card, where did u get the musical notes from? Your cards are so beautiful and I especially love this red card. The tree is super cute and I love the way you used the holiday phrases as a background. Beautiful job. Looking forward to seeing more of your work! What a great card! The twine is a perfect touch! Thank you for sharing! Beautiful card! Love the red, white, and kraft color combo. Very festive. A lovely card. 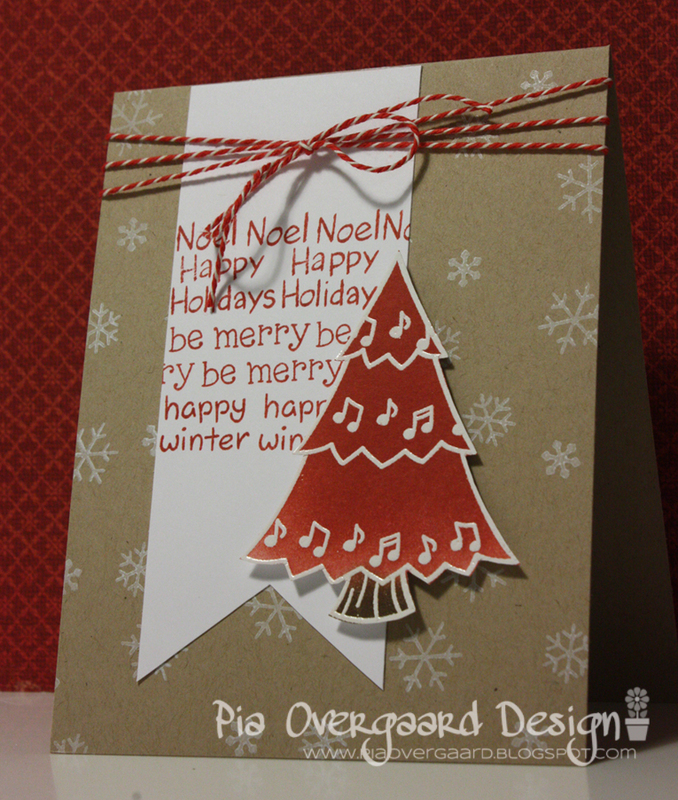 The white embossing looks great on red and I like the way you have put the musical notes on the Christmas tree. Love the red Christmas tree! Great card! what a beautiful design! i love that you used kraft, white and red. the banner shape is the perfect backer for the red tree...and i love the white embossing too! Waouw et smukt julekort. Sødt med noderne på træet. Love this card! So clever how you embossed the musical notes! Love the red tree. It looks great. TFS your creation. Very cute and I like the music notes on the tree. I just love red and kraft! And I adore your tree stamps with the music background! Love the white embossing! Great card!